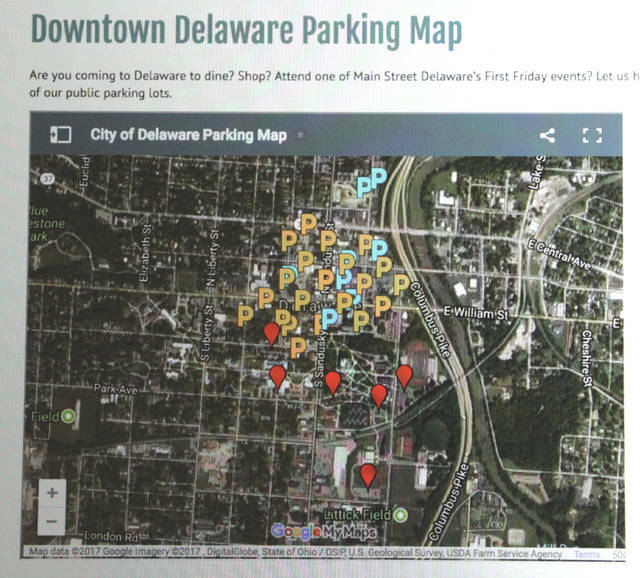 The City of Delaware has posted a downtown parking map on its website. Visit www.delawareohio.net/parking/ to access the map. Looking for places to park in downtown Delaware? Sure you are. Especially during special events like First Friday. Well, the City of Delaware is offering a solution — a fun one — to your dilemma. Delaware unveiled its #DelaWhere2Park social media campaign this week in conjunction with Main Street Delaware’s First Friday event. Main Street Delaware and downtown businesses are partnering with the city in the initiative. Released earlier this year, the parking study determined that there are more than 3,300 parking spaces in the survey area, which includes, according to the City of Delaware website, “all of Downtown Delaware, adjacent residential blocks, small portions of the Ohio Wesleyan University campus, and portions of the Northwest Neighborhood.” The number of public parking spaces totaled 1,531, while private spaces totaled 1,773. Scott said social media — Facebook and Twitter, specifically — stood out as the best way to engage the community, so she created #DelaWhere2Park. It’s part information, part contest. The information component helps people find places to park on First Friday. The contest aspect features local businesses providing prizes for people who participate in the campaign. “At least a week leading up to First Friday, we release a series of social media posts on our Facebook and Twitter pages, giving out a clue to a mystery parking lot,” Scott said. “The clue is pretty easy to figure out. We’re not trying to make it ‘Jeopardy.’ If people are able to identify the parking lot, they will need to park in that lot between 6:30 and 7:30 p.m. (on First Friday). The initial clue Scott posted this week was well engaged by social media users, she said. Main Street Delaware Executive Director Susie Bibler said the #DelaWhere2Park initiative will have far-reaching benefits for visitors to the downtown district. To participate in the #DelaWhere2Park promotion, like the City of Delaware’s Facebook page titled City of Delaware, Ohio – Government, and follow the city’s Twitter account @Delaware_Ohio. The city has also created a page called “The Future of Downtown Parking” that includes the parking study as well as a listing of the improvements officials have planned for parking in Delaware. Visit www.delawareohio.net/the-future-of-downtown-parking/ for information. Reach Andrew Carter at acarter@aimmediamidwest.com and follow him on Twitter @DelOhioEditor.